Historically, the development of public parks and pools in New York City have been spurred by promoting public health and hygiene, generating employment, and increasing public access to New York’s water resources. This project aims to realign and expand this focus through the development of a public pool in East Williamsburg, Brooklyn, which also integrates a water treatment facility and streetscape improvements that filter storm-water runoff in the area. This site of the pool is adjacent to Newtown Creek, a polluted industrial zone that experiences significant flooding from storms. 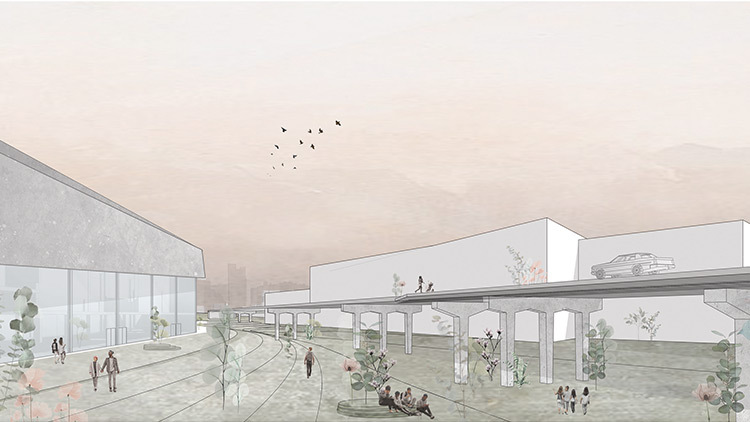 Exorcise Pool aims to address the overburdened existing infrastructure through the redesign of the streetscape. More specifically, through the creation of bioswales, landscape elements featuring wetland plants that help absorb and filter storm-water runoff. In addition to the treatment of storm water, bioswales can serve as public spaces and act as a connective tissue through the neighborhood. The integration of a public pool with a water treatment facility, which would process the storm-water runoff from the bioswale network, functions as piece of occupiable infrastructure, making explicit the land’s relationship to water and the public. The water treatment facility also serves the pool-going public, with locker rooms and a lifeguard station on its ground floor, and also a mister/shower feature that also serves as a lounging area. On the upper level is a classroom that can serve as a space to educate the public about storm-water treatment. The project is not intended only to reverse the effect of storm water runoff, but also to generate a dialogue about our relationship with the built environment. The public pool provides a shared experience where the recognition of precisely how the pool exists is inextricable from the water and landscape that surrounds it.